If you intend to drive to Louvain-la-Neuve, take the exit number 8A on the Brussels-Namur-Luxembourg Motorway (E411), then follow the directions "Louvain-la-Neuve Sud", "Biéreau" or "Bruyères". 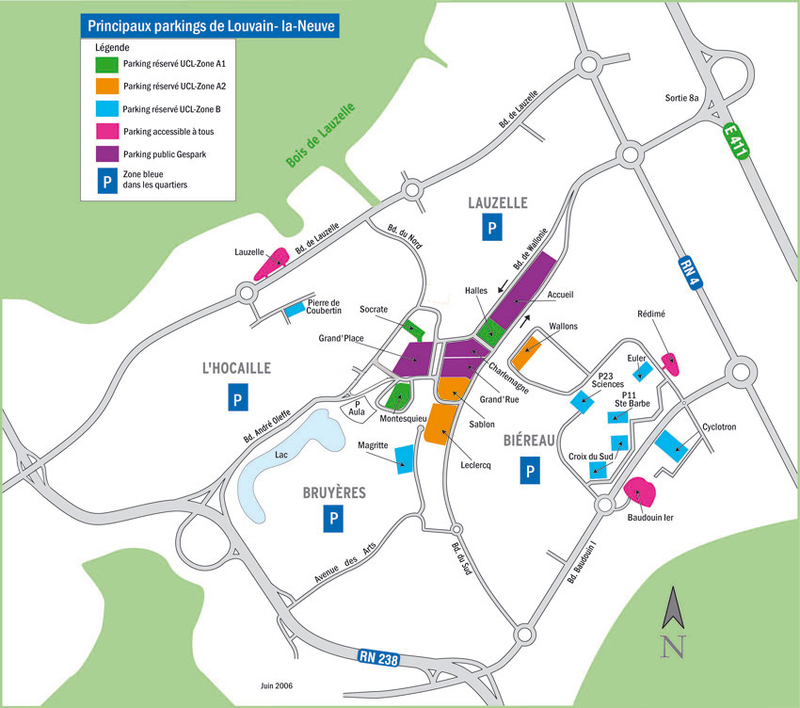 Note that nearly everywhere in Louvain-la-Neuve, you should use a parking disk. You can leave your car in one of the free parking grounds (appearing in purple on this map. 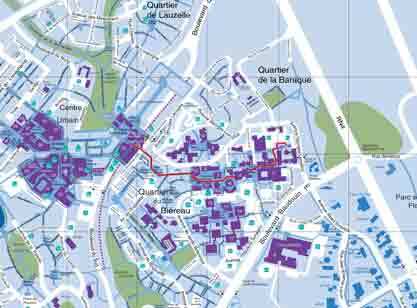 The free "Rédimé" parking lot (on the right half of the map) is very close to the Euler building. To have access to one of the UCL parking grounds, contact your host. The Euler building is at a ten-minute walk from the train station in Louvain-la-Neuve. From the train station, walk up the street "rue des Wallons", all the way through "Place des Wallons", "Place Galilée" and "Place des Sciences" (a place with wooden floor). From the "Place des Sciences", follow the indications for "Sainte Barbe". Walk through the building "Sainte-Barbe" and exit on the other side of the building. You are on the "Place Sainte Barbe". Continue straight on. The entry to the Stevin Building is on your left. Further on is the Maxwell building. To access the Euler building (ICTEAM/INMA), turn left just before entering the Maxwell building, walk 50 m, enter the parking on your right and go up the stairs. You now see the Euler building on your right. The secretary's office is on the first floor. Brussels National Airport. The main airport close to Louvain-la-Neuve is the national airport: Brussels National Airport at Zaventem (BRU). From the airport you can take a taxi directly to Louvain-la-Neuve (cost: about 70 €). The airport is also connected by train to the train station "Bruxelles-Nord" in Brussels. There are regular connections and the journey takes about 30'. From "Bruxelles-Nord", you can then take a train to Louvain-la-Neuve (see above). Charleroi Brussels-South Airport. There is also a much smaller airport (mostly operated by Ryanair) on the South of Brussels: Brussels- South Airport at Charleroi-Gosselies (CRL). From the this airport, there is a bus service (line A) to the railway station of Charleroi (Charleroi-Sud), where you can take a train to Louvain-la-Neuve (via Ottignies). The journey lasts for a little more than an hour.